Bhubaneswar: In a dignified function of Annual General Meeting of Indian Red Cross Society and St. John Ambulance organised at Rashtrapati Bhawan, New Delhi on 30.08.2016, Dr. Chakradhar Panda, Honorary Secretary of the Indian Red Cross Society, Odisha State Branch and Dr. Major. 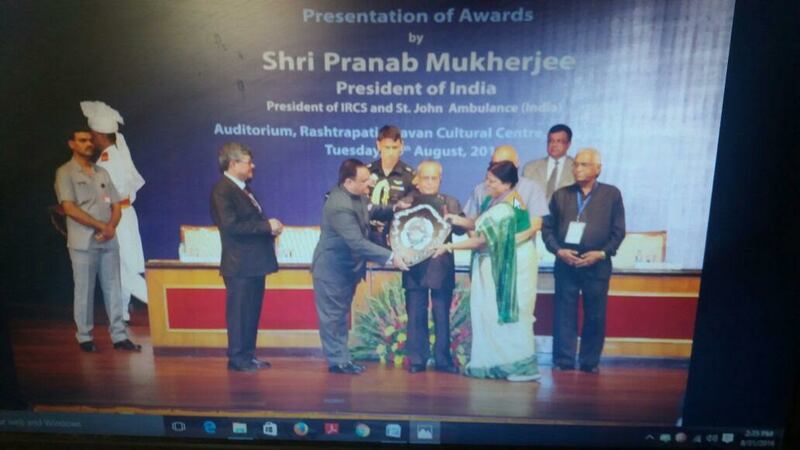 Kalpana Das, Honorary Joint Secretary received award from His Excellency, the President of India, Sj. Pranab Mukherjee, for Fund Raising and Membership Running Shield – 1st Position & Blood Donation Running Shield for Collection of Highest Number of Voluntary Blood for the year 2014-15 and 2015-16. Besides, Sri Gopal Krushna Mishra, YRC Counsellor, DKN College, Erancha, Cuttack received IRCS-Gold Medal for the Year 2015-16 from His Excellency, the President of India and Sri Umakanta Nag, YRC Counsellor, Sonepur College, Sonepur also received IRCS Award of Merit Certificate for the Year 2015-16 from Hon’ble Minister, Health & Family Welfare, Govt. of India for Voluntary Service. This year Red Cross Odisha State Branch also awarded with Nagar Bandhu Sanmana from Hon’ble Chief Minister on “Local Self Governance Day”. Among other, Shri Jagat Prakash Nadda, Hon’ble Minister, Health & Family Welfare, Govt. of India & Chairman, Indian Red Cross Society and many officials & members of Red Cross & St. John Ambulance of different states were present in this function.